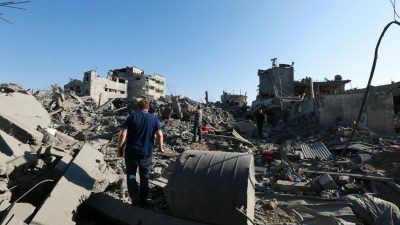 Twenty seven days of ongoing Israeli offensives on Gaza have passed. The magnitude of death and destruction left is huge, the humanitarian conditions no longer bearable. Entire families have been wiped out, their homes demolished while those who survived are left with an immeasurable pain and agony to deal with life after.Close to half a million people have become internally displaced. In Shijaeya neighborhood, east of Gaza city, entire blocks were brought down and levelled to the ground when Israel stepped up its offensive on July 20th. Six days later, a temporary ceasefire for twelve hours gave people and aid workers the chance to return to the area to check out the mass destruction. As we walked in, a strong stench hit us in the face telling us that here still lay some people, buried beneath the rubble. The destruction is massive and it will take so much time and equipment to dig up what’s left of those who once lived in this neighborhood. “I can’t even find the street entrance to where I used to live. I don’t know where my house, or what’s left of it is.” One eye witness, who came to check out the damage in his neighborhood, told us. Paramedics were allowed to access this neighborhood six days after the Israeli massacre took place. They dug up at least seventy bodies from here. The electricity supply to Gaza Strip is down to zero hours per day after Israel bombed Gaza’s one and only power plant. For the fifth day in a row, Gaza is in the dark. In return, many places cannot get water as pumping it requires electricity. Mobile and internet services are very limited and are about to be cut off in light of the absence of electricity. In addition to bombing fuel tanks of the Gaza’s power plant, which will require long months to repair, Israel has also destroyed most of the Israeli electricity lines supplying power to Gaza. Municipalities in Gaza warned of an imminent environmental disaster if the situation does not improve as all water treatment plants will stop operating due to the shortage of electricity and fuel, which in turn will produce floods of sewage. While people are trying to survive this ordeal, some of the most basic things have become unavailable in Gaza. Having no power to operate electric appliances at home is adding to daily burdens faced by people. For example, not being able to use refrigerators, people started buying their food on a daily basis. This has become a hassle though. Lines to purchase bread are extremely long and food shelves in the markets are empty as suppliers are unable to reach these stores. In light of these circumstance, announcing a humanitarian ceasefire has become the only chance people wait for in order to go to the market and supply their homes with basic necessities. Israeli forces however, have not been respecting any of the declared ceasefires, and another massacre was committed against al-Shijaeya neighborhood late Wednesday, July 31st, afternoon (which was supposed to be a period of ceasefire) when Israeli forces bombed a busy market and hit fuel tanks in a nearby gas station killing and injuring many. When people gathered to assist the injured, Israeli tanks bombed again and the death toll was 17, including paramedics and a journalist while more than 150 were injured. So far, close to half a million people have fled their homes and taken shelter in UN-run schools and hospitals, are staying with relatives or even on the streets. Israel bombed a number of the UN-run schools, the last of which was during the early morning hours of Wednesday July 30th, when three missiles hit a school in Jabalia, targeting classrooms, killing 17 people, including a one year old child and injuring many others. The UN has numerously informed Israel of the coordinates of its schools. In addition to numerous problems facing the health facilities, including shortage in medications and medical supplies, one major problem that has surfaced recently is the lack of space to store dead bodies. Morgues are over stacked. In al-Shifa hospital, the biggest medical center in Gaza, people had to leave the body of their relative in the X-ray department until they are able to bury him. In Rafah, the Israeli army ordered the one and only hospital there, Abu Yousef Alnajjar, to evacuate and shut down. Doctors said they had to keep dead bodies in vegetable and ice cream coolers. 1696 people have died, 9000 injured and hundreds of thousands have been displaced as a result of 7200 bombs dropped by the Israeli forces onto Palestinian homes, hospitals, schools, mosques and institutions. 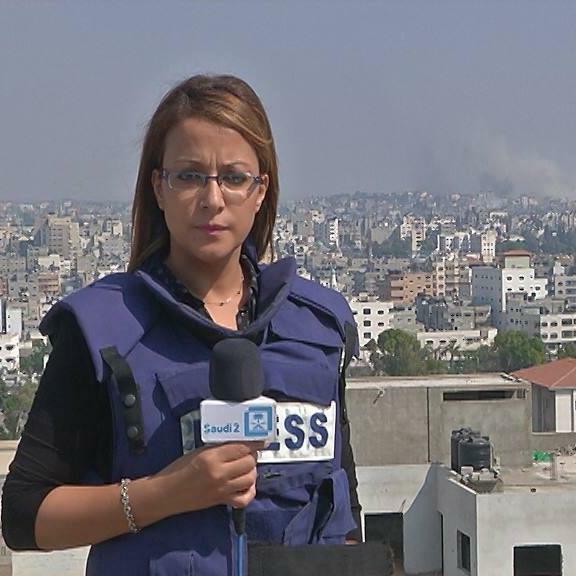 Maha Elbanna is a Palestinian American journalist. She works as a news reporter for the Saudi TV English Channel. Having lived and worked in Gaza Strip for the past nine years, she has reported on three wars, an internal rift and other major events. Maha also works for a health NGO, teaches English language and translates for an online news website. Previous post ISRAEL'S 'PROTECTIVE EDGE': WHY NOW?